This is the underdrawing of a partial copy of a copy by Sir Peter Paul Rubens of a painting by Quentin Matsys (Quinten Matsijs) of the famous early 16th century doctor, surgeon, medical philosopher and alchemist, Paracelsus. 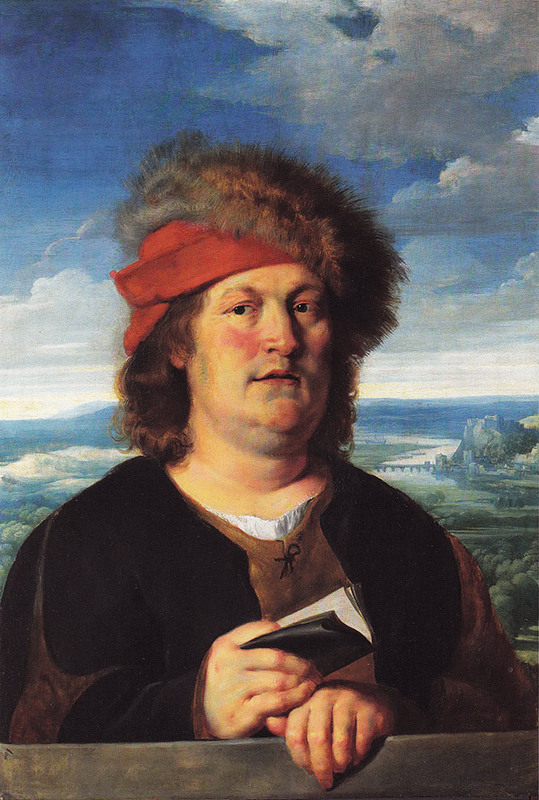 Paracelsus (1493-1541) was a giant of early medicine; he founded toxicology and had the insight that some diseases have psychological roots. Paracelsus also discovered hydrogen but didn’t realise that it was a new element, so is not credited with its discovery. This is an example of a wholly different type of painting, one that once was ubiquitous and hugely successful, but now hardly exists, being a glue-size tempera painting on canvas. It’s strange to think that most Medieval paintings were produced in this medium, but virtually none exist now (I can only think of a few, the best known being a Dieric Bouts ‘Entombment’ in the National Gallery in London). It’s chiefly due to the fact that they were made as banners, wall hangings, flags, screens… pretty much anything really, but all items that don’t usually survive, especially as the medium is easily damaged by water and insects. Matsys’ original painting was most likely however an oil on panel piece (as is Ruben’s copy, and as are the few other anonymous copies that also exist), but I wanted to do a glue-size tempera (I used fish-glue). I paint a few of these a year as they are very rapid drying and have a certain pale charm about them. However, largely I just like doing them. 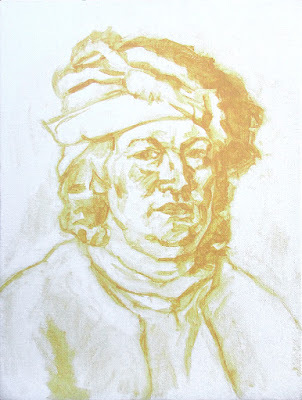 I have only laid in a quick drawing using yellow ochre glue-tempera at this stage (sadly a rather bad photo). This amount of underdrawing is enough to get started with, the rest I can "eyeball" in later. Glue-size tempera has the advantage that if you work fast wet-on-tack can be done, but is still pretty fast drying. I will reasonably rapidly work this up with additional painting and water washes to blend in areas. As a medium glue-size tempera also has the property of being reversible, so I will protect the final painting with a spirit based picture varnish. Good modern varnishes, of course, were something that they didn’t have in the Middle Ages.